Dominic Mercurio is hitting .324 on the season with 44 hits. 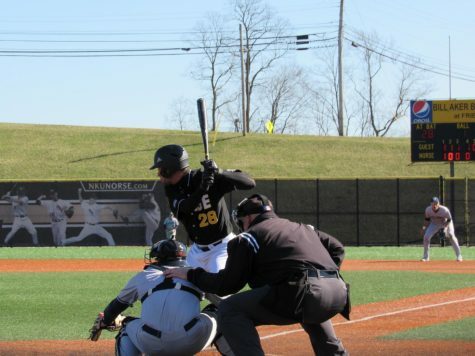 The NKU baseball team fell to Wright State 5-3 in game two of the three game series, sealing a series loss. The Norse fall to 15-27 on the season and 8-10 in conference play while the Raiders improve to 28-12 on the season and 15-3 in conference play. Dizzy Peyton continued to fill the role of head coach while Todd Asalon served the second game of his four game suspension. 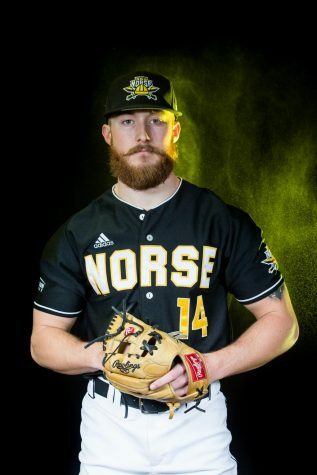 The Norse struggled to score runs against Raider starting pitcher Ryan Weiss, who threw 7.0 innings and allowed seven hits but didn’t allow a Norse runner to score. Weiss also struck out 10 batters and improved his record to 5-0. “We got some hits but we didn’t really get hits when it mattered,” Peyton said. 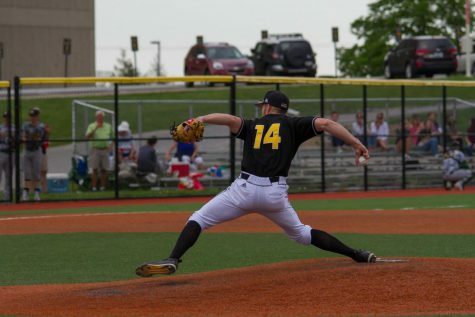 Brody Basilone started on the mound for the Norse and retired six of the first seven batters he faced. The Raiders struck in the third inning, starting with a fielders choice with one out that scored Kevin Whatley. After a stolen base by JD Orr, who reached on the fielder’s choice, Adrian Marquez hit an RBI single that scored Orr. Gabe Snyder followed with an RBI double that hit off the right field fence to give Wright State a 3-0 lead. Basilone finished his day strong, throwing 5.0 innings and allowing three runs, four hits and struck out five batters. Basilone would end up taking the loss for the Norse. Jordan Menfee entered the game in the sixth inning in relief of Basilone. Menfee got two quick outs in inning, but allowed a walk and an infield single to put runners on first and second. After a double steal, Menfee induced a groundball to the short stop Dominic Mercurio who threw the ball in front of first baseman Trey Ganns who couldn’t pick the ball out of the dirt, allowing both runners to score. Ganns said after the game he should have been able to make the scoop while Peyton was disappointed with Mercurio’s lack of focus. That was all the Raiders would need to secure the victory. 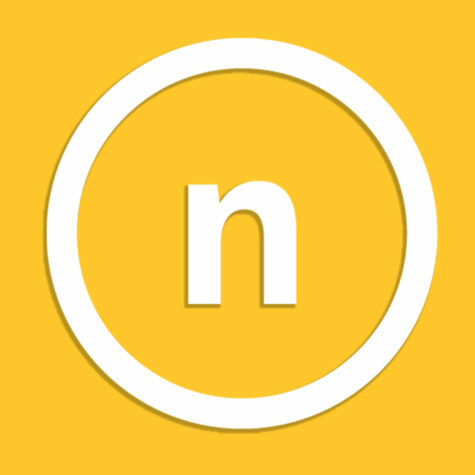 The Norse left nine runners on base through out the game. 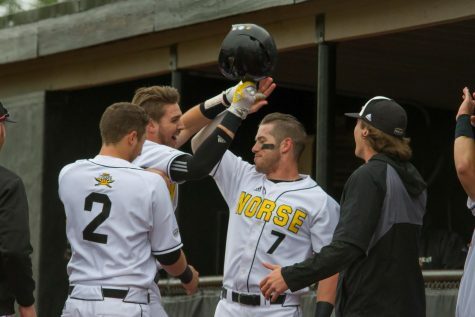 The Norse had a chance to score in the fourth inning, when the Norse loaded the bases against Weiss with two outs. However, Weiss would make quick work of Conor Ledger, who struck out to end the Norse threat. 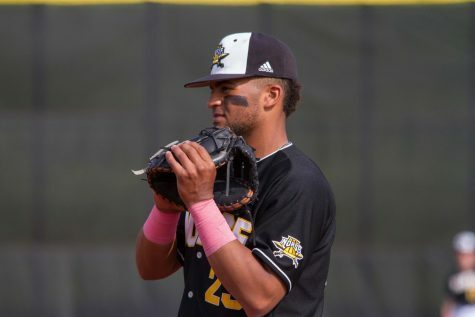 The Norse threatened again in the ninth inning against Jeremy Randolph, who allowed two straight hits to Chad Roberts and Mike Moffatt. 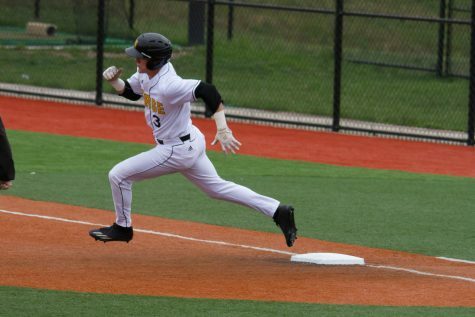 After a fielder choice, Jake Richmond singled to left field, and an error by the left fielder allowed Moffatt to score. TJ Alas then followed with a two out double that scored Richmond and Ledger to give the Raiders a 5-3 lead with two outs. The next batter, Will Haueter, flew out to right field to end the Norse comeback attempt. 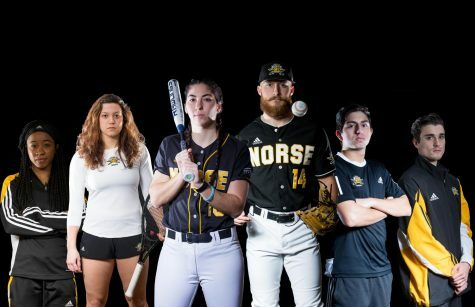 Ganns went 2-4 at the plate for the Norse with a double while Alas went 1-5 with two RBI and has now reach base in 33 consecutive games. “I just picked up a pattern they were going by. They tried to get ahead with a fast ball away and then either a fast ball in or off speed in,” Ganns said. 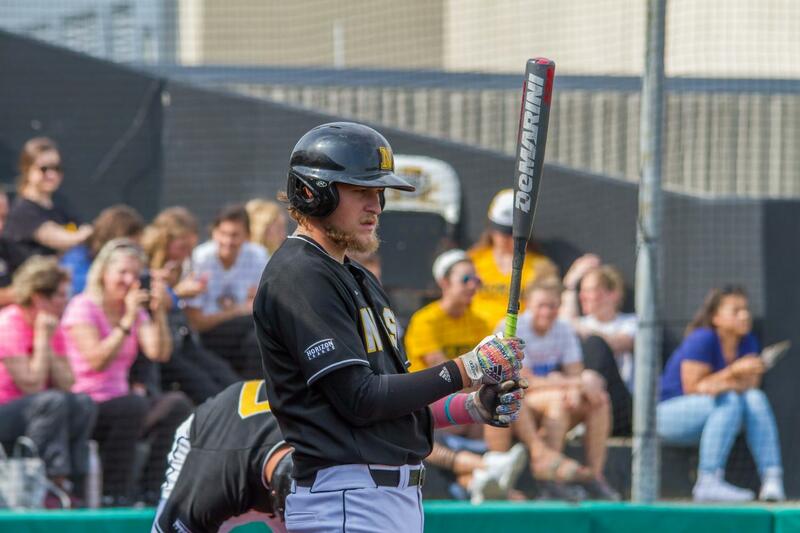 Ganns is now batting .352 for the season with 15 doubles. Adrian Marquez went 2-5 at the plate with an RBI and a run scored while Gabe Sanders went 2-5 with an RBI. 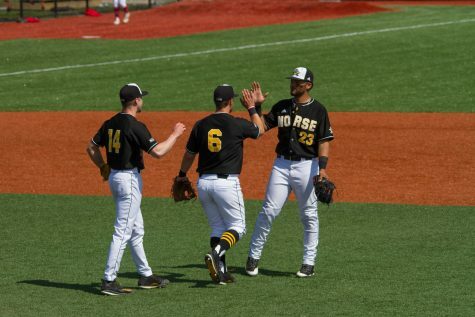 The Raiders also stole four bases against the Norse, making their two day stolen base total eight and gives the Raiders 102 stolen bases on the year. Haueter did manage to throw out a base runner for the first time in this series. 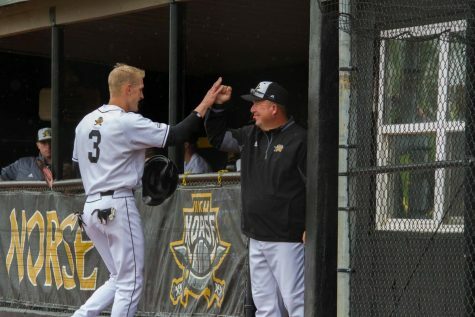 The Norse will try to avoid a three game sweep against the Raiders tomorrow at Bill Aker Baseball Complex. Ganns will take the mound looking for his second straight quality start after last weeks 7.0 inning, two run no decision against UIC. He will face left hander Zane Collins, who has a 1.73 ERA in 10 starts. First pitch is scheduled for noon tomorrow.